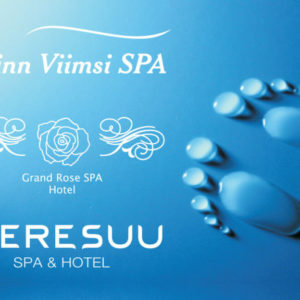 An ideal opportunity to give your friend or loved one a gift card that is valid at the Meresuu SPA & Hotel, Tallinn Viimsi SPA, SPA18+, Atlantis H2O Aquapark, Viimsi Cinema, Black Rose Pub and the Grand Rose SPA Hotel in Saaremaa, offering them some luxurious relaxation and the best vacation possible. 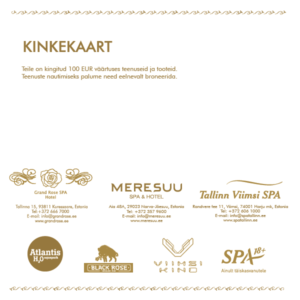 The joint gift card can be used multiple times, up to the extent of the selected limit. Internet bank links have been established with the following Estonian banks: Swedbank, SEB, Nordea, LHV, Danske Bank, and Krediidipank. When required, we will send you a gift card by registered post (post costs 3 € will be added to the invoice).